Whenever I’ve moved, and planning to make a new house into a home, the first thing I feel I need to do, other than to locate the kettle and have a cuppa or three, isn’t unpacking, it’s to get the carpets properly and professionally cleaned. There’s nothing like a good, deep down thorough clean to freshen the house you want to call home. It’s the same if I’ve lived in the house a while, too. Carpets inevitably get grubby, and no amount of vacuuming will clean marks and scuffs off them. Children, pets and everyone else walking in and out will leave trails on even the finest Axminster, whether you have a shoes-off-at-the-door rule or not. By removing any fibre damaging dirt particles, a good, deep professional clean will also extend the life of your carpet, not to mention getting rid of any lingering viruses and odour causing bacteria. So, it’s a good idea to have a reliable business in your phone book that offers carpet cleaning in London. There are a huge amount of carpet cleaning companies, so how do you go about selecting the best one for you? What can I expect from a reliable, specialist carpet cleaning company? How can I find a reliable, experienced carpet cleaning company? During the carpet cleaning process, many specialist companies use a blend of environmentally safe, non toxic chemicals for odour control, stain removal and rinsing agents. Some of the cheaper products used by the less than reputable companies can be toxic to people, pets and the environment. Therefore, it is essential that the wastewater and solid waste, consisting mainly of carpet fibres, dirt, hair, and grit generated from the cleaning process, are disposed of in an appropriate method – this may or may not happen with a ‘cowboy’ company. These harsh chemicals can actually damage your carpets, too, either because they are the wrong chemical for the type of carpet material or stain, because residue is left behind or because optical brighteners are used to make your carpet look cleaner than it actually is. Often these chemicals have a high alkaline or acid pH which adds to their potential to ruin carpet fibres. The latest trend in carpet cleaning is the use of crystallising chemistry. This uses agents which, as the carpet dries, form a hard, or tacky, layer coating each fibre. Over time these chemicals can damage the fibres, or if they leave a tacky residue, result in rapid resoiling, which allows bacteria to build up within the carpet fibres, or virus spores to be trapped. So, you can see how much damage the incorrect treatment, or an inexperienced, ‘cowboy’ team, can do. Right from start to finish, a superior carpet cleaning company will treat you, your home and your carpets with respect and knowledge. 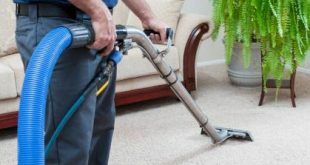 They will have established their own routines to ensure your carpet is cleaned thoroughly, but the process usually follows a similar pattern. 1) Firstly, a reputable company will look at the areas you want cleaned, visually inspecting the carpet fibres and level and type of soiling. This ensures that they use the correct cleaning product for your carpet’s requirements. 2) Next comes the room preparation. Most reputable companies will include the moving of light furniture in their service. So, please ensure that they have somewhere safe to put the removed furniture, and a clear path to do so. 3) Using an exceptionally high powered industry approved vacuum cleaner, the team will then extract grit and dirt from the deepest levels of carpet fibres. This removes the worst of the dirt, thus allowing the cleaning solution to act more efficiently. 4) The appropriate cleaning solution is applied to break down all of the dirt particles, kill off any lurking viruses and bacteria, and eliminate odours. With any reputable cleaning company, this solution will be environmentally friendly and safe for children and pets. 5) The solution is brushed deep into the carpet, making sure it covers every single fibre in the whole carpet, from tip to base. This is usually left in situ for a few minutes, allowing it to do its job thoroughly. 6) Next the team will use a high-pressure water extraction machine. This powerful appliance efficiently forces very hot water deep into your carpet, where it mixes with the solution, before being sucked back out again – along with all the dirt, bacteria and grime. Your carpet is left spotlessly clean – even deep down, with no nasty odours. 7) Because of the unavoidable disturbance of the carpet’s fibres, the cleaning team will groom and reset your carpet, making sure that the pile and visual appearance is perfect. 8) A reputable company will always talk you through exactly what they have done, and answer any questions you may have regarding aftercare. 9) Finally, the team will carefully return your furniture back in the room. As we become more aware of, and concerned about, the environment, we make a choice – to pick a company that still uses harmful chemicals, or choose one that considers their impact on the world, insisting on only using environmentally friendly, non toxic chemicals. Looking through the list produced from an online search can be daunting, there are so many carpet cleaning companies, where do you start? You need a company that’s reliable, has an excellent track record, and cares about their environmental impact. A London Carpet Cleaner business that also takes your wishes, and lifestyle on board, and works hard to cause as little disruption to your family as possible. Maybe you want your upholstery freshened up, or leather furnishings cleaned, too; well, a good carpet cleaning company will tackle that task with ease. With a company like that in your phone book, you can rest assured that your carpets will have a long, happy life, and always look fantastic. You also know that your family and pets won’t be harmed by any nasty chemicals, and the environment will be safe for a little while longer.